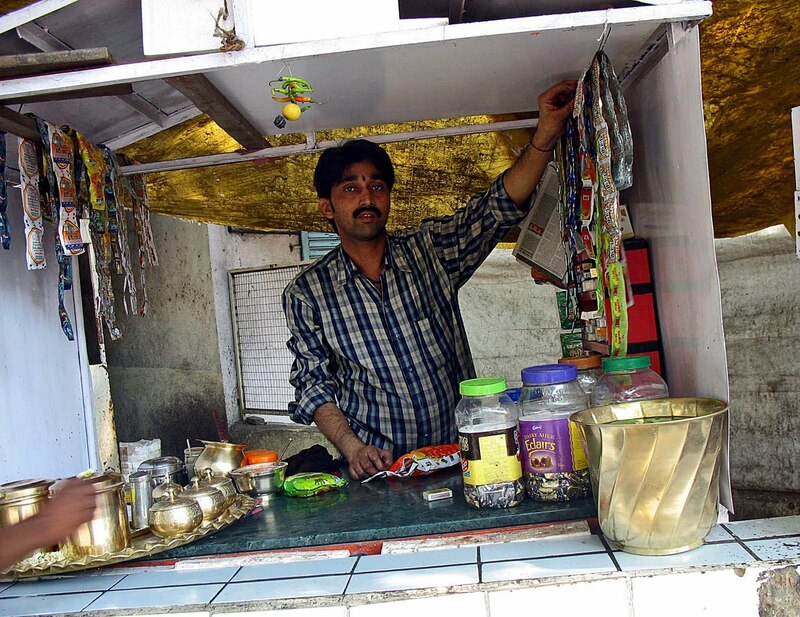 Shops which sell paan and paan vendors are dime a dozen in India. They can be found at street corners and outside eateries, hotels and restaurants. The paan walas or makers of paan make the paan out of betel leaf, rollling it with a filling of finely chopped betel nut and flavour it with slaked lime paste. Sometimes saffron and gulkand as well as other spices are used. Paan is considered "a breath freshener, and for digestive purposes. It is offered to guests and visitors as a sign of hospitality (after meals at both personal and social occasions" (Wiki). Many customers demand a tobacco filling as well. It is common to find people chewing tobacco wrapped in betel leaf. 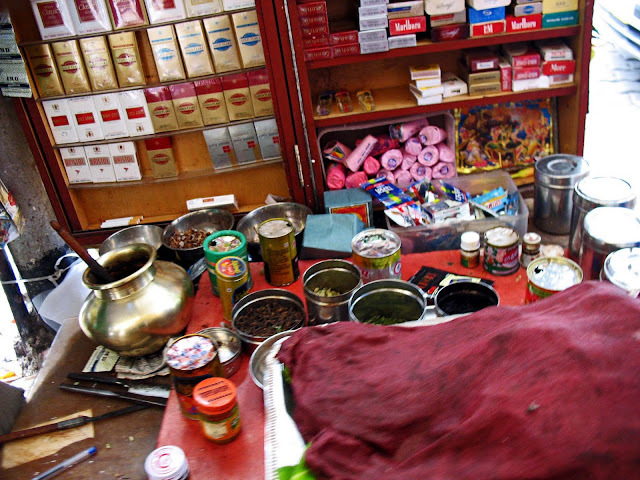 This photograph shows the ingredients that make up a paan or what is called paan masala. You can see Kattha in the large brass pitcher. Many of the small plastic containers which are covered are different types of tobacco. The open boxes with the brown mush are different kinds of supari. The betel leaves are covered with a damp red cloth. Chuna is also used, and is probably in one of the covered steel boxes. At times a concentrated form of tobacco is used, very fragrant, almost spicy, and this can be seen in a small covered box next to another type of tobacco. In the background of the picture you can see cigarettes of different brands, many of of them imported. The small pink rolls are bidis, cigarettes made of leaves and without a filter. A few filtered cigarettes lie at the bottom of the shelf, as customers often pick up one for a smoke. These places usually have a smoldering thick rope at the side, so that customers can light up their cigarette or bidi. These two photos are of paan vendors in India in their little shops. His ware is placed in shiny brass containers. 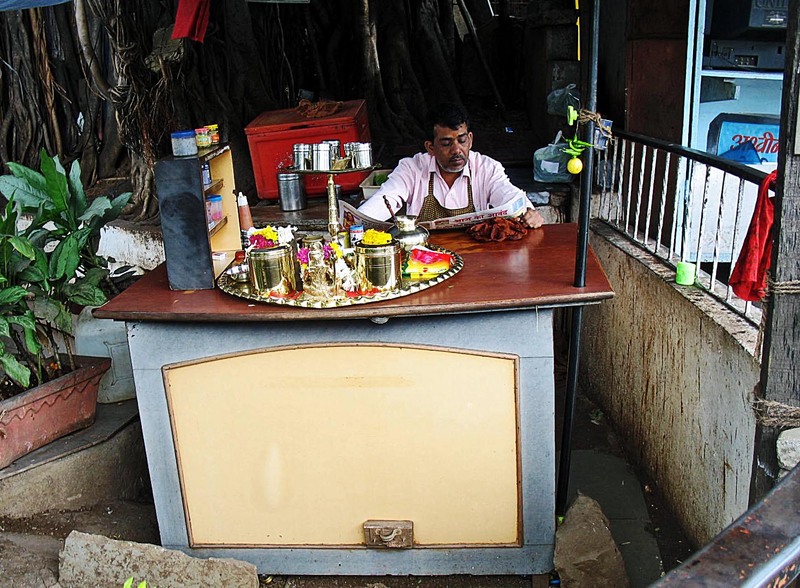 A paan vendor outside a hotel.